Here we go with the snow again! 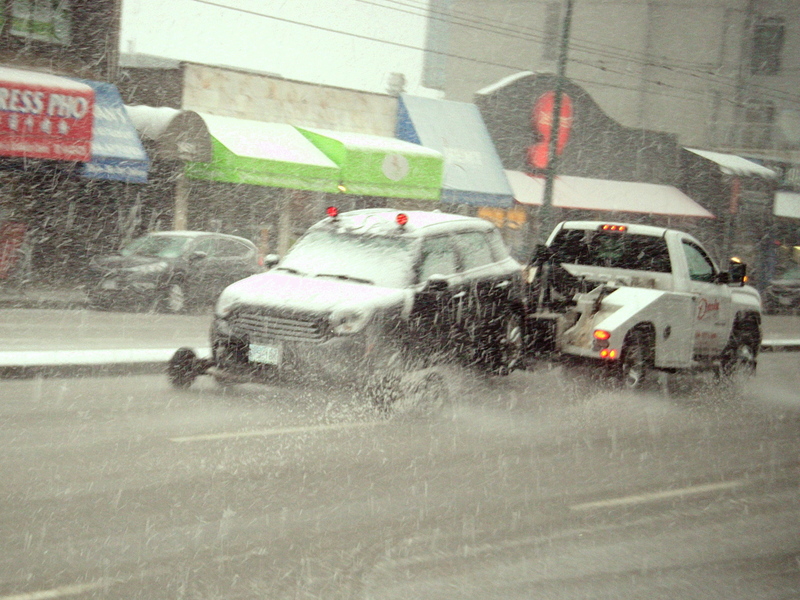 An early casualty of the morning flurries being hauled eastbound through the 1400 block of West Broadway Avenue. As the predicted snowfall kicked into into high gear around 10 a.m. Friday (February 22nd), morning rush hour in the 1400 block of West Broadway Avenue seemed briefly to melt away. Many Vancouverites had, I thought, heeded last night’s snow warning and chose to either use transit or start their weekend a day early. But light as traffic may have been, by 11 a.m., it was backing up both ways through the 1400 block—moving as slowly as molasses would on such a cold and snowy day. 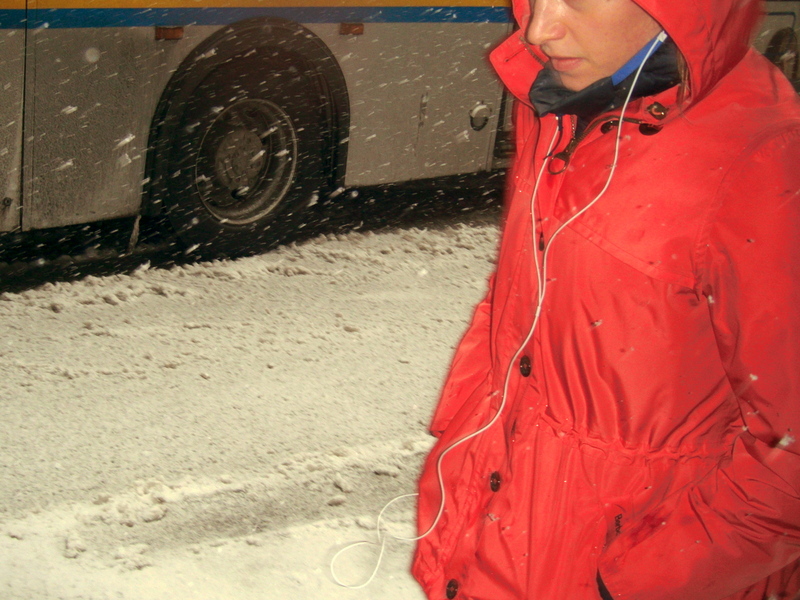 A pedestrian does her best to tune out the snow at 11:01 a.m. 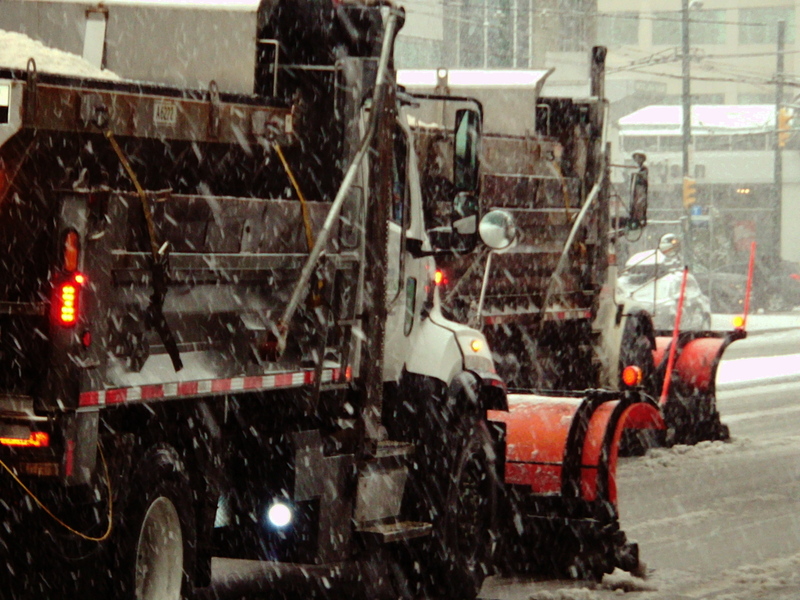 The original forecast Thursday evening was for five to ten centimetres-worth of snow to begin falling in the overnight hours of Friday and I did see hints of slush on side street lawns at 7 a.m. But it wasn’t until about 8:30 a.m. that I saw snow actually falling—and then it was inconsequentially light. 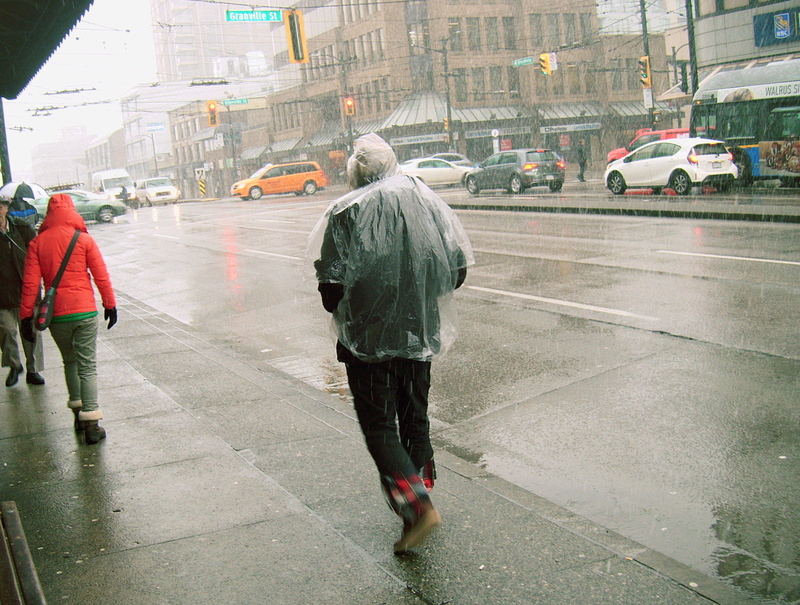 A street-embedded person wearing a dollar store rain poncho at 9:47—minutes before the snow really began to fall. By 10 a.m., however, the snow suddenly (and seemingly) kicked it up several notches and within a quarter hour both the roadway and sidewalks of the 1400 block of West Broadway were white with wet snow. 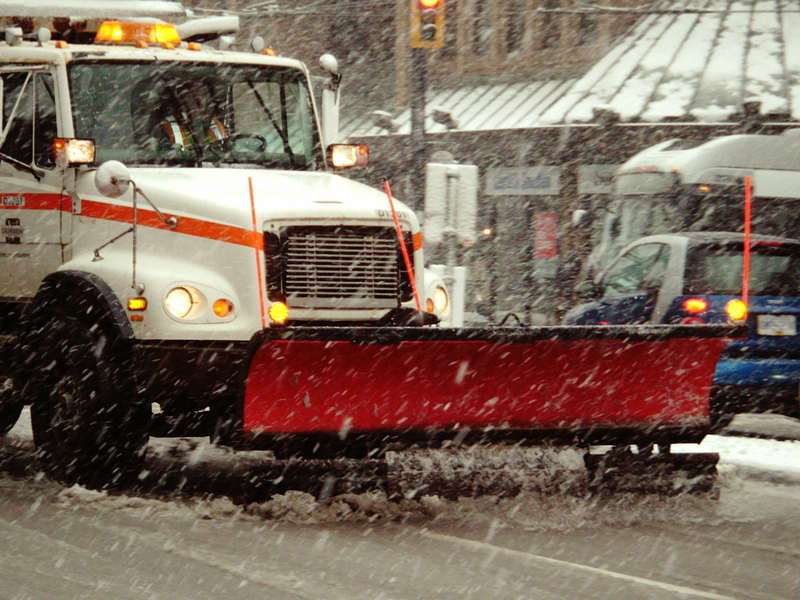 A City of Vancouver plow truck begins rounding the corner of South Granville onto West Broadway at 11:23 a.m.
At 11:13 a.m., the snow was still falling steadily but in lighter quantities than an hour earlier. West Broadway was covered in many rills of off-white slush and its sidewalks were only as clear of snow as the tramping feet of pedestrians had been able to make them. Here’s the same truck plowing through the slush on West Broadway. At the last weather report, the temperature was 2°C (feels like -5°C) and no more or less snow was forecast than previously. 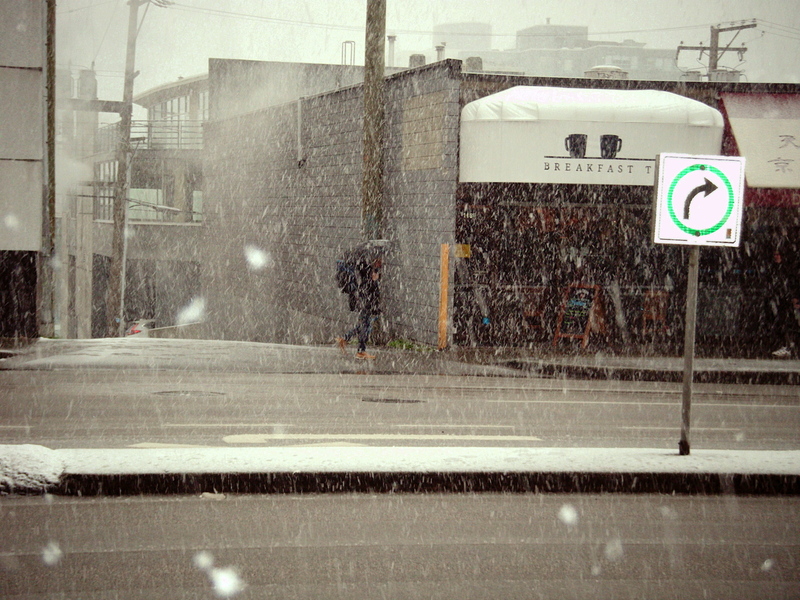 In that case—and at the rate the snow has been falling—I expect and hope that it will stop by early afternoon. Click the images to enlarge them. 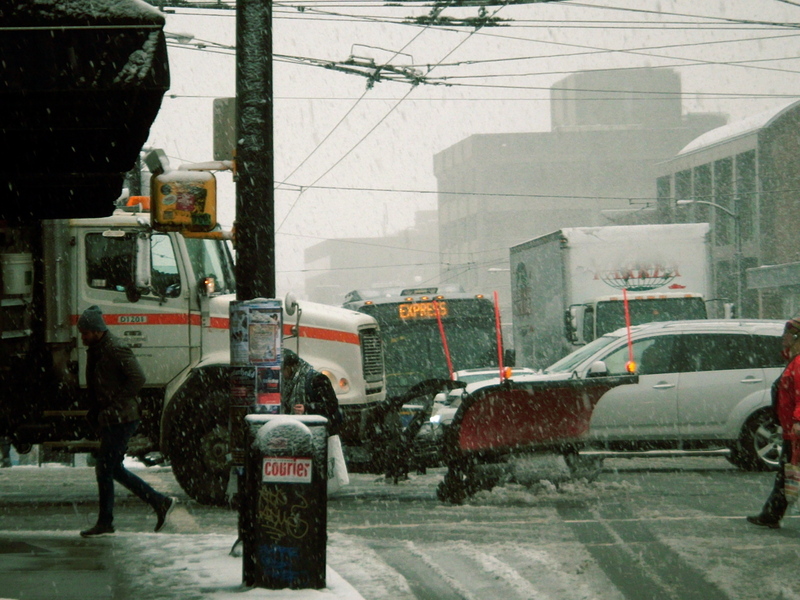 Within a minute a second truck appears—for a rare display of synchronized snow plowing on West Broadway. Yesterday was very strange at 11:00. The weather totally changed at 39th and Granville from a winter blizzard, to light cloud and by the time I got to the south side of the Tunnel it was 8C and sunny.